promisee in exchange for the promise. When will court imply a bargain?  Equivalence of exchange not required as long as it’s truly bargained for. received information about the insurance company. Can’t figure out how to send in application. be unable to help him. 2 weeks pass and his wife dies. sent it in even if they hadn’t made him that promise to help. of the land. He was gaining something from her act of moving. Not just gratuitous promise. an arbitration clause that said any disputes must be settled with arbitration. for complying with this agreement. Issue: Whether at-will employment constitutes consideration. Reasoning: Fairness, arbitration is advantageous to employers who are frequent arbitrators. to enforce at any time and employee not getting anything from that. Holding: Continued employment constituted valid consideration for enforcing contract. Reasoning: Power dynamic. Employer in position of power. he makes. Lady Duff Gordon starts putting her name on products behind Wood’s back. Webb $15 every 2 weeks for rest of his life. Starts paying him. Then he dies. Procedure: Webb sued McGowan estate to recover unpaid installments. Issue: Was there consideration for the promise? Reasoning: McGowan got a lot (saved from death) and Webb significantly harmed. Not a gift. 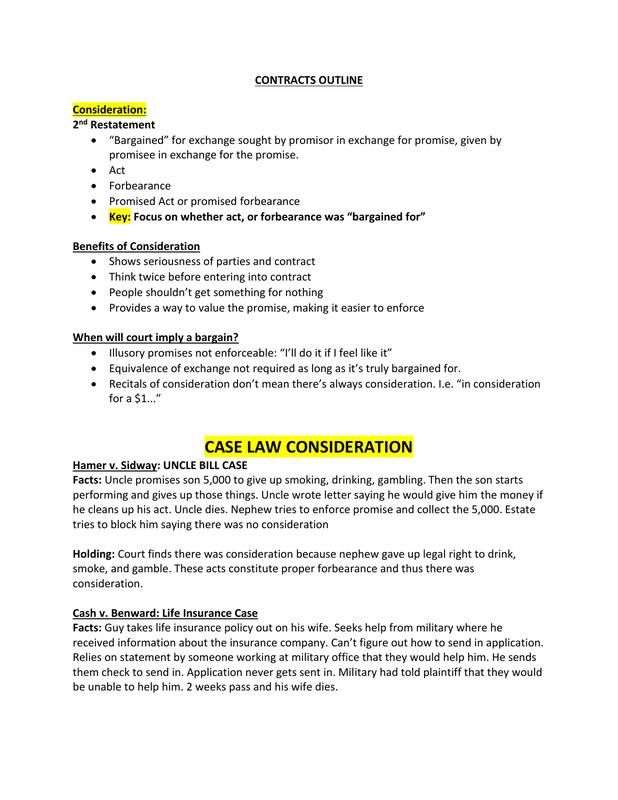 Procedure: Granddaughter sues executor of estate to enforce promise. Rule: Promissory Estoppel makes promise enforceable because of granddaughter’s reliance. promise and gave up her job. Difficult for women to get a job back maybe during this time. Analyze Ricketts: Under Promissory Estoppel enforceable? Promised to give her money. Gave a reason why he wanted for her to stop working. Forbearance: Reasonable to quit job after receiving promise of large sum of money. Promised induced her to quit her job. Injustice avoided only by enforcement? Required by justice? How easy to get another job? Justice requires enforcement. him.” No mention of sum of money or percentage salary Hayes would receive. Issue: Whether there’s consideration or sufficient reliance to establish enforceable promise. Holding: No promissory estoppel. Can’t show reasonable reliance. contract to pay the fare. Or, diner in the restaurant agrees to pay listed price of food. Implied in law contract (Quasi Contract): Promise implied by law for reasons of justice. Something of value is given. The person who received it ought to pay for it. Quasi contracts: They are obligations created by law for reasons of justice. Can be found in contrary to the party’s intention. Where do we see implied Contracts? Doctor walking in street comes across unconscious person. for time/using medical degree to treat that person. them had they been conscious. o Paid at average price of doctor).  What would reasonable person under similar circumstances expect? they use heavy steel. Suggestion committee informs plaintiff that suggestion was rejected. Several years later, suggestion implemented. 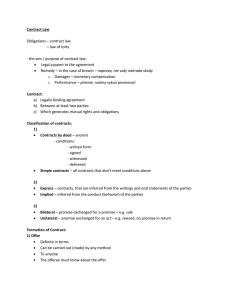 contract). Plaintiff states a cause of action. 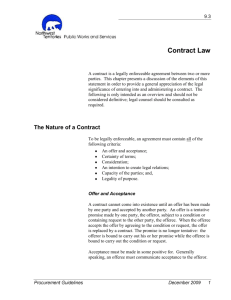 Rule: Quasi Contracts: Implied in law contracts. program solicited ideas that it could reject if it wished. between parties of contract. Here unjust to not consider Plaintiff’s claim. included in the pamphlet were redeemable. Fighter Jet not included in pamphlet. in, and actual value of fighter jet. then the accepted executed second counteroffer to the designated escrow agent. Holding: Seller could revoke offer before time set to expire. No enforceable contract. contract and offeree learns of this through reliable source. option, proposes exchange on fair terms within reasonable time. -Sale of Goods: Things that move, tangible personal property. NOTE: Real Estate and Service Contracts not covered by UCC. Covered by Restatement! rule makes sense. Applying the UCC by analogy. Procedure: Plaintiff sues for damages from defendant for failing to do paving job at bid price. Issue: Was defendant’s bid revocable? substantial character on the part of the promisee. this option is binding and supported by consideration for enforcement. Procedure: Plaintiff sought to enforce stock options. Rule: Continued employment by which one is not bound is consideration for stock option. Plaintiffs gave time and effort in consideration for stock options.  When performance starts, offeror cannot revoke.  Once performance begins, offeree bound to complete.  Painting House Hypo-must complete paint job.  Acceptance enforceable as soon as it is posted (sent).  Revocation enforceable as soon as offeree receives revocation. Enforceable contract. Person can’t get out of that unless both agree or there’s a breach.  Acceptance later received by original offeror. 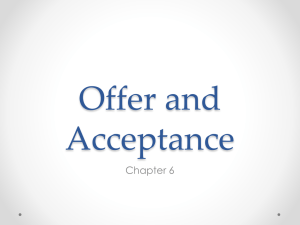  Acceptance acts as merely counter offer and it’s up to original offeror to accept. There is a contract because rejection had not yet been received. 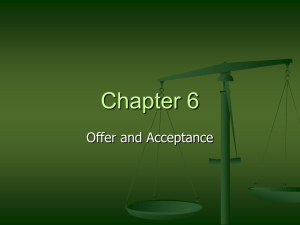  Acceptance under option contract operative once received by offeror. made. Mailbox rule doesn’t apply. August 20th but said notice was never received. Procedure: Optionee sues to enforce option contract. Holding: Plaintiff gave proper notice of accepting option contract by sending it in the mail. Rule: Mailbox rule applies to option contract (irrevocable offers). Effective upon dispatch. Reasoning: Fact that optioner doesn’t know is risk with doing business by mail. Mason doesn’t want to enforce contract. b. Offeror explicitly says silence viewed as acceptance. notify offeror if doesn’t intend to accept. buyer to think that by remaining silent, farmer seller Mason agreeing to the terms. a. Offeree can accept in any manner that is reasonable in the circumstances. by performance within reasonable time. Minneapolis St. L. Ry. Co v. Columbus Rollingmill Co.
offer eliminates power of acceptance of original offer. Issue: Whether P’s 12/19 order for a telegram was an acceptance of original offer. Rule: Mirror Image Rule: Acceptance must be identical to offer in order to be effective. conditional on those different/additional terms. 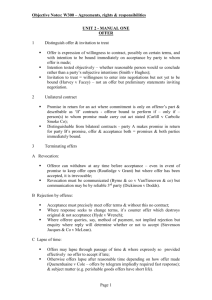 c. Notification of seller’s objection to terms given in reasonable time. upon plus any supplemental terms from 2-207(2). knocks both terms out and supplements with terms from UCC. claims indemnity provision releases them from paying for injuries. Issue: Is the indemnity provision included term in the contract? Holding: Indemnity clause not included additional term. Notification of rejection of additional terms within reasonable time. supplemental terms in any part of the UCC, including 2-207(2). where seller reserved right to decide whether to accept. Not a true offer. arguably, this was a material term as well. Issue: Is there a contract? 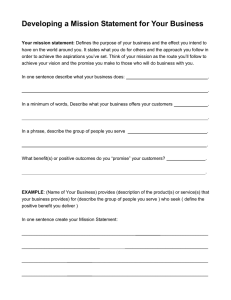 Are the terms those that are included in the order sent by the buyer. Holding: The terms in buyer’s order form are additional terms included in the contract.  Are the buyer/seller merchants?  Does the offer expressly limit the terms?  Is there notification of rejection of the terms within reasonable time? Reasoning: Oral agreement established a contract between buyer and seller. people with experience. 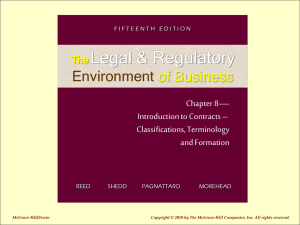 Terms do not materially alter contract because no surprise or hardship. Silence frequently viewed as acceptance in the industry. Not expressly limited by the offer. Seller did not object within reasonable time. clause. Zeidenburg disregarded and used software for commercial use. contract? Must buyers of computer software obey the terms of “shrink-wrap” licenses? the terms of the box. the buyer will have accepted those terms.  Offer fully communicated when buyer has reasonable time to review terms.  Fair and equitable under circumstances not foreseeable to parties. as there is good faith. and legitimate commercial reason to modify contract.  Statute of Frauds applies. steel not enforceable consideration for modification. Rule: Under common law, modifications require consideration to be enforceable. subjective (nebulous). Not reasonably objective. Time! Promise not at the time of the bargain. Consideration: Bargained for. Sought by promisor in exchange for promise given by promisee. demands after it determines it cannot obtain substitute parts on Contract 1 from other sources. After delivery, Loral demands refund on price increases that it already paid on Contract 1. Procedure: Parties sue each other. Issue: Whether price increases under the circumstances amount to economic duress. pay price increase to Austin. to another vendor with whom he was unfamiliar with or dissatisfied to secure the parts. item of military machinery requiring parts with strictest engineering standards. moving to California. Landlord wants them to pay in full. Issue: Whether there was consideration to make settlement agreement enforceable. Rule: To be binding, a modification of contract must be supported by consideration. promise on good faith to pay, not definite, no consideration. Facts: Mathis died of ruptured aneurism. Mathis widow threatened to sue for wrongful death. fees incurred from defense in the wrongful death suit. Mathis signed agreement. Later, Mathis had a change of heart and sued for wrongful death. Procedure: Trial court said there was consideration for the covenant. Holding: Affirmed Trial Court. There was consideration for the covenant agreement not to sue. 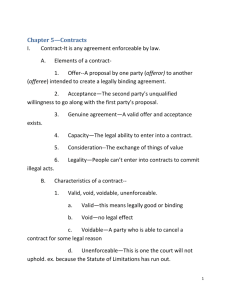 contract when the promisor has a good faith belief in the validity of the claim. refuses to help her pay for expenses. court awards her that money. John appeals. Issue: Whether the paid in full check was accord and satisfaction for the contract agreement. Holding: Reverses Trial Court decision finding check was accord and satisfaction. good faith. Neither party remembered the date for which the 10,000 had to be paid. disciplinary policy (series of steps before terminating employees (warnings, counseling, etc). Payne was fired without receiving any of the steps of the manuel. disclaimer was included term in the contract. Holding: Court sides with Payne. and expectations founded upon them. issue of fact as to whether the Hospital intended to modify the employment relationship. Waiver: Intentional Relinquishment of a known right. of that waiver would be unjust because of a material change. 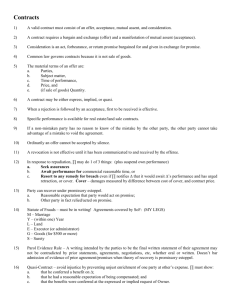 Modification: Contract to change a contract. to change back to original contract. out. Says school didn’t help him when they said they would. Procedure: Abrams sues school for breach of contract. Rule: Language of promise and terms must be reasonably definite. reduced workload. They didn’t do “nothing”. Issue: Is this statement an actionable express warranty under the UCC? Enforceable promise? Holding: Language was an actionable express warranty. part of the bargain. Actionable. talk” and puffing is expected and seller should be aware of this.  Status of parties: Car dealers held to higher standard. o Consumer more likely to rely on statements made by salesmen merchant. o Car salesmen have more knowledge about the goods. o Statements relate to how reliable the car is.  Car is a complex good, and also can be dangerous. purchases cookware. Buyer finds out cookware sold at discount stores for a lot cheaper. Issue: Statements express warranties? Breach of express warranty? Holding: No statement of express warranty. No breach of warranty. harm, nature of good, whether written or oral. You cannot rely on statements about value. Reasoning: Applying the factor weighing test, no express warranty.  Goods quality: Not about the use of the product or safety. justifiably relied on by plaintiff, causing damages. Enough terms? Open Terms? Easy to Enforce? Which terms are left open? o Significant Terms left open like Price Quantity duration? 2. UCC 2-204: Intent to be bound + reasonably certain basis for giving appropriate remedy. UCC provides gap filler terms like price(2-305) or delivery date (2-309). at or around time of expiration. Lessor did not renew lease. lease. Terms too wide open. Not appropriate for court to write the lease contract. Facts: Berrey leased space from Jeffcoat for a restaurant. though promise not definite enough, still can recover under promissory estoppel. Sale of Goods more than $500? Land Sale? Can’t be performed in under a year? If yes, is there a sufficient writing?  No written notice of objection after 10 days. Contract Completely Integrated or Partially Integrated?